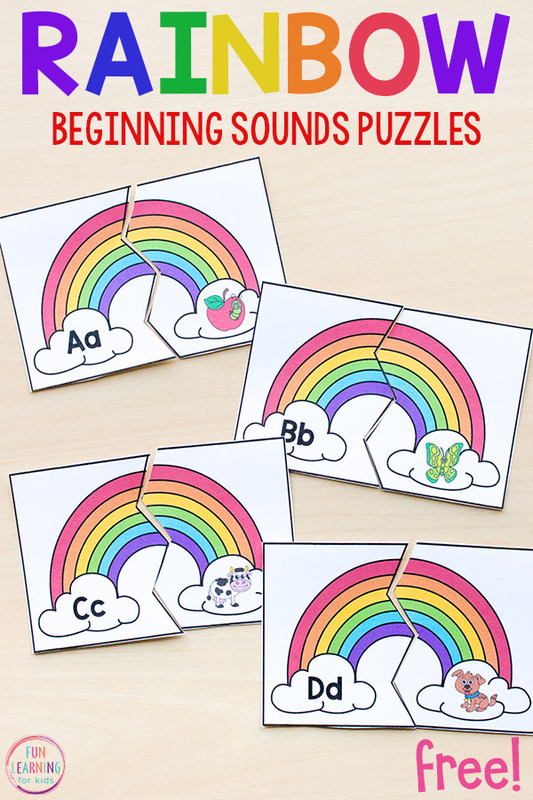 Grab these rainbow beginning sounds puzzles and make learning letter sounds hands-on and fun this spring! 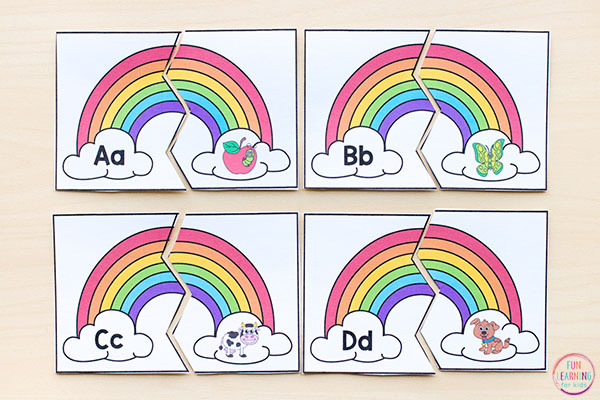 Whether you are looking for rainbow theme activities for literacy centers, need another St. Patrick’s Day activity or just want to do a simple alphabet activity with the kids, these rainbow puzzles are great for you! 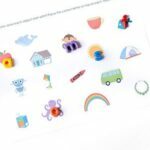 Do your kids love rainbows? 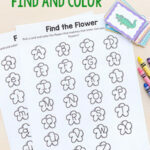 They are so bright and colorful and make activities even more engaging. Kids just seem to gravitate towards them. 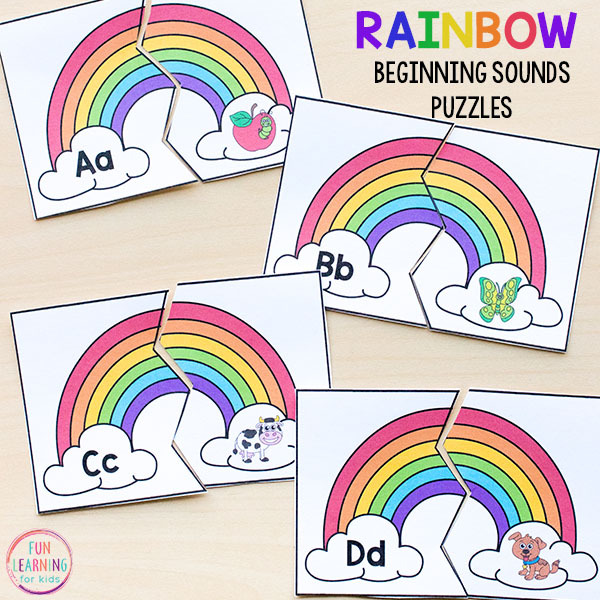 That’s why these rainbow beginning sounds puzzles are great! They keep kids engaged while learning letter sounds. And when you are teaching young kids, that’s imperative. 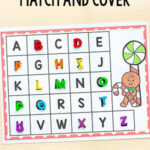 Related: Check out these Shamrock Roll and Cover Letter Sounds Mats! 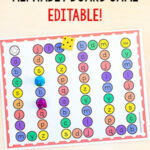 These puzzles would be perfect for literacy or alphabet centers. They would also be great for morning work or early finishers. There are so many ways to use them! 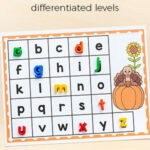 While using them children will learn to identify letters and their sounds. They will also practice identifying the beginning sound in a word. 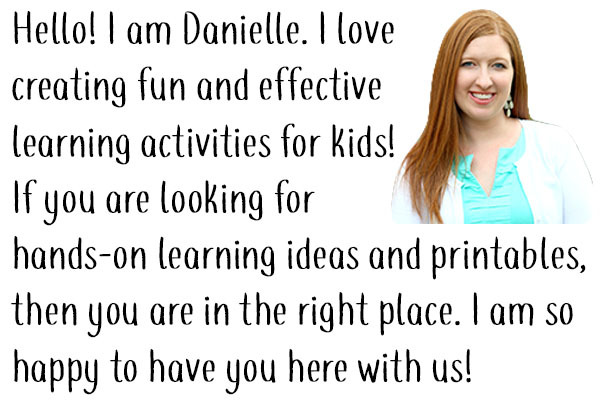 You don’t need any special supplies, but I would recommend printing them on cardstock for added durability. I invited my 4.5 year old try out the puzzles. She was very excited when she saw them because she is a big fan of rainbows. To begin, I kept it very simple. I only put 4 rainbow puzzles out on the table. I mixed the pieces all up and then asked her if she could match them up. She is just starting to really remember the sounds for each letter. There are still lots that she doesn’t know, but I made sure to use letters I knew she had a chance at remembering. I also like to say the name of the object out loud and really emphasize the beginning sound of the word. This is very helpful to her. So if you are using these in a one on one or small group situation I would suggest doing something similar. 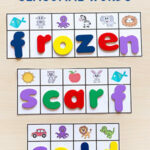 Then you can use it as an independent activity for kids who know most of the letter sounds already. If you want to make it self-correcting, you can write the letter very small on the back of the picture portion of each puzzle piece. 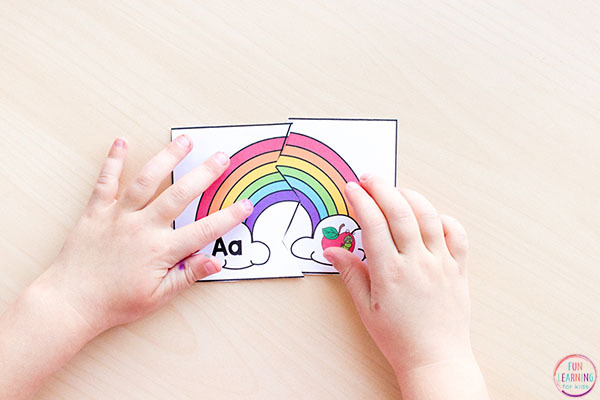 Here are some more awesome rainbow activities! Or check out these shamrock roll and cover number mats! 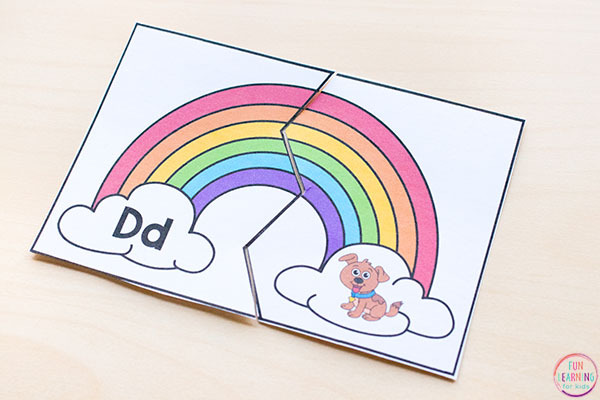 I love this rainbow art puzzle from Fun-a-Day too!